A leading American evangelical minister—whom public figures long turned to for guidance in faith and politics—recounts his three conversions, from childhood Jewish roots to Christianity, from a pure faith to a highly politicized one, and from the religious right to the simplicity of Jesus’ Sermon on the Mount. Rob Schenck’s extraordinary life has been at the center of the intersection between evangelical Christianity and modern politics. Attacked by partisans on both sides of the aisle, he has been called a "right-wing hate monger," the "ultimate D.C. power-broker," a "traitor" and "turncoat." Now, this influential spiritual adviser to America’s political class chronicles his controversial, sometimes troubling career in this revelatory and often shocking memoir. As a teenager in the 1970s, Schenck converted from Judaism to Christianity and found his calling in public ministry. In the 1980s, he, like his twin brother, became a radical activist leader of the anti-abortion movement. In the wake of his hero Ronald Reagan’s rise to the White House, Schenck became a leading figure in the religious right inside the Beltway. Emboldened by his authority and access to the highest reaches of government, Schenck was a zealous warrior, brazenly mixing ministry with Republican political activism—even confronting President Bill Clinton during a midnight Christmas Eve service at Washington’s National Cathedral. But in the past few years Schenck has undergone another conversion—his most meaningful transition yet. Increasingly troubled by the part he played in the corruption of religion by politics, this man of faith has returned to the purity of the gospel. Like Paul on the Road to Damascus, he had an epiphany: revisiting the lessons of love that Jesus imparted, Schenck realized he had strayed from his deepest convictions. Reaffirming his core spiritual beliefs, Schenck today works to liberate the evangelical community from the oppression of the narrowest interpretation of the gospel, and to urge Washington conservatives to move beyond partisan battles and forsake the politics of hate, fear, and violence. As a preacher, he continues to spread the word of the Lord with humility and a deep awareness of his past transgressions. In this moving and inspiring memoir, he reflects on his path to God, his unconscious abandonment of his principles, and his return to the convictions that guide him. 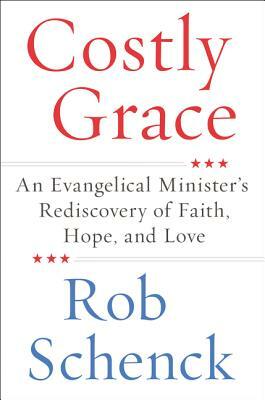 Costly Grace is a fascinating and ultimately redemptive account of one man’s life in politics and faith. Rob Schenck has been in public ministry since the late 1970s. He founded and has directed several influential religious organizations and has written essays for the New York Times, USA Today, the Washington Post, TIME, the Chicago Tribune, the Los Angeles Times, the Houston Post, the Atlanta Journal-Constitution, the Orlando Sentinel, the Daily Beast, the Huffington Post, and VICE News. He is the subject of Abigail Disney’s Emmy Award–winning documentary, The Armor of Light. Schenck, an ordained minister, serves on numerous nonprofit boards, including P&R Schenck, Associates in Evangelism, Inc., the National Clergy Council, the Advisory Commission on Minority Engagement for the National Center for State Courts, and the Board of Presbyters of the (Old Line Evangelical) Methodist Episcopal Church USA. In 2015, he was named a senior fellow of the Centre for the Study of Law and Public Policy at Oxford, and became the founding president of the Dietrich Bonhoeffer Institute, Washington, D.C. Reverend Schenck continues to guest preach across the U.S. and around the world.